I found the birds under unlikely circumstances. An early blizzard had taken me by surprise as I was packing a bull caribou out of the Kenai Mountains on my horses. The weather had forced me to take an unfamiliar route back to the Sterling Highway through a pass I’d never traveled before. Although survival was my main priority at the time, the clouds of rock ptarmigan I found concentrated in the pass left an indelible impression. Later that week when the weather cleared, I made the five-mile hike from the highway to the pass with my shotgun and bird dog. That effort led to one of the most furious days of wingshooting I’ve ever experienced. By the time I headed off the mountain, I’d converted a box of shells into a backpack full of ptarmigan dinners—all from public land. Ruffed grouse in blazing New England foliage, sharptails in native prairie grasses . 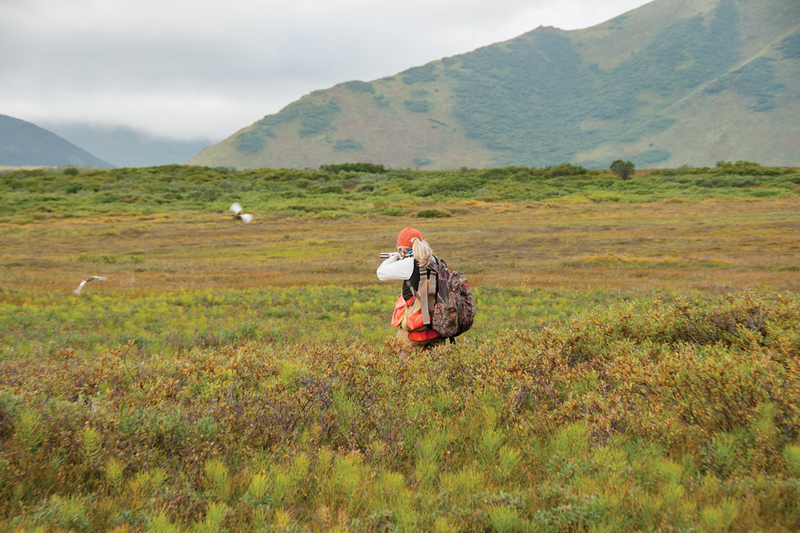 . . those classic settings are familiar to most grouse hunters, but few realize that some of the country’s best grouse hunting can be had in Alaska, where the majority of gamebird habitat lies in the public domain. And while the best of Alaska’s big-game hunting usually requires at least some travel by bush aircraft or boat, the state’s seven grouse species are so widely distributed and receive so little hunting pressure that anyone willing to do some hiking can reach productive areas from the road. Alaska’s three varieties of ptarmigan are the state’s best-known gamebirds, and they are grouse. In fact, the willow ptarmigan, Alaska’s state bird, is a close relative of the British Isles’ famous red grouse. Willow ptarmigan occur throughout the state, except in heavily forested parts of the Interior, and are accessible by road along parts of the Richardson, Parks and Denali highways in open tundra terrain interspersed with willows. Rock ptarmigan live at higher elevations in the same areas, favoring rocky terrain with sparser foliage. White-tailed ptarmigan are most abundant in alpine habitat in the Southeast Panhandle. Highway 2 between Haines and the Alaska Highway runs through suitable habitat. Spruce grouse are the most widely distributed of the state’s “forest” gamebirds. 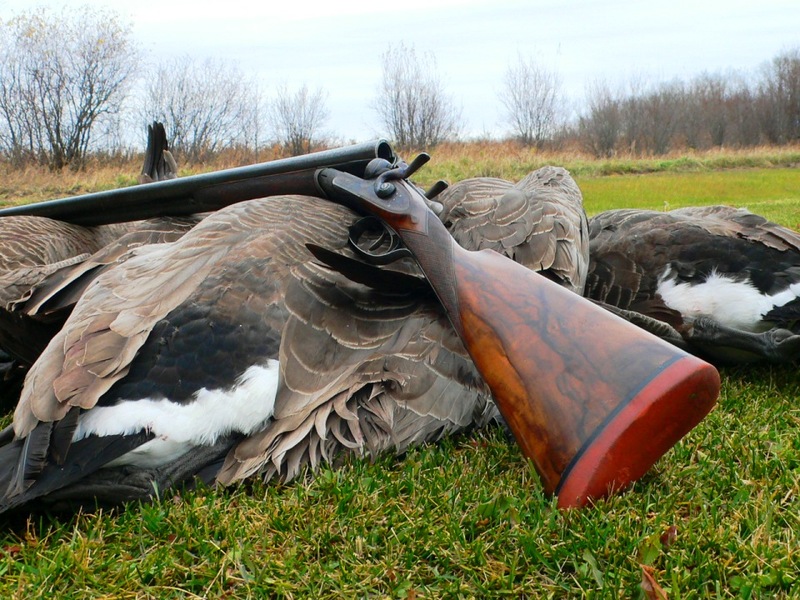 While their “fool hen” behavior makes them a great source of camp meat, they don’t offer much challenge to wingshooters. Sooty grouse occur in coastal areas along the Panhandle. This brings us to two familiar characters: ruffed grouse and sharptails. The heart of Alaska’s ruffed grouse population inhabits the Interior along the drainages of the Yukon, Kuskokwim and Tanana rivers. While much of this country is not accessible by road, the Elliott, Steese and Dalton highways near Fairbanks traverse good ruffed grouse habitat characterized by aspen stands along the junction of tundra and spruce forest. Decades ago the state successfully transplanted ruffs into the Matanuska-Susitna Valley just north of Anchorage. Sharptails came as a surprise when I first moved to Alaska. Found in the same areas as ruffs, sharptails are closely related to ptarmigan, with which they share several behavioral and physical characteristics. During the 1980s the state subsidized a large grain program near Delta Junction, south of Fairbanks. That area now provides some of the best sharptail hunting in the state, and it’s almost all road accessible. I have several friends who have managed the trifecta there—spruce, ruffed and sharp-tailed grouse—in the same day. Some of Alaska’s 26 Game Management Units are larger than some states in the Lower 48, so hunting regulations are necessarily complex. Upland bird seasons are long, generally starting in August, and limits are generous; but always consult current regulations prior to hunting. Although 90 percent of Alaska is public ground, the state does contain private land, most of it owned by Native Corporations. Permission is required to hunt the latter. For more information about licenses, regulations and species, contact the Alaska Dept. of Fish and Game. For maps and information about public lands from multiple management agencies, contact Alaska Centers. Pheasant Bonanza offers 2,500 acres of prime upland cover as well as luxury accommodations in the new Benjamin Schoonover Lodge.